Newsletter Grannies - Looking for new challenges? Boredom, or in modern times the so-called "bore-out", can quickly lead to illness in senior citizens. This is the conclusion come to by Professor Ursula Lehr, who held the Gerontology Chair in Heidelberg for many years. Insufficient challenges often lead to fatigue, lack of drive and insomnia. Quality of life in older age is decisively dependent on the feeling of being needed. The experts advise seeking new challenges in the form of a meaningful task: for example, learning a new language, studying once again, or taking over voluntary work. A very special challenge is being a Granny Aupair: getting to know a new culture, meeting new people or learning a different language! At the moment, various families around the world are looking for a loving temporary Granny, who would like to support them with advice and deeds. We would like to introduce you to three of them below. And we would also like to know what kind of experiences you have had regarding visa issuance. You can find more about this below in this newsletter. “Towards new shores” is our rallying call! This vibrant, forward thinking and cosmopolitan city on the East coast of Spain is the country's third largest city and has a fantastic heritage and culture. The old town, cathedral, art deco food market and many more attractions are waiting to be explored. Our partner agency (User name Conchi Ruiz) is urgently looking for an English speaking Granny Aupair for a small family of three, who live in the city, as their planned Granny Aupair could not come due to private reasons. More information about the family is available via the partner agency, there are no extra costs involved. Loads of history and culture, plus music, pubs and Guinness are waiting for you in the capital of the Emerald Isle. Named UNESCO City of Literature in 2010, Dublin offers a multitude of sights and things to explore. Here a family (user name JoyceHanna) is looking for a friendly, cheerful, energetic helper/companion with a drivers license, who is also fond of dogs for the 82 year old father. The Granny should enjoy conversation and doing activities and maybe discovering Ireland. A nice room with private bath in a large house in the outskirts is waiting for the Granny. In the pleasant small town of Verona in New Jersey, in the midst of the Watchung hills but also not far from New York City, this international family of six (user name dboutle) are looking for an organized, energetic, child- and animal loving temporary Granny to support them looking after their four small children (two girls 4 and 2 years old and 10 month old twin boys). The Granny should also have a driving license. The two little girls are in pre-school until the afternoon on three days a week. A lovely room with private bath in a large house in the outskirts is available for the Granny. The family often spends their weekend in the lake houe. The travel costs will be taken over completely. Unfortunately a special Granny Aupair visa does not exist yet. 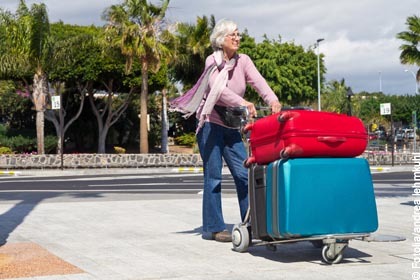 If you travel to a country which requires a visa as a temporary Granny, you cannot officially travel as an au pair. Au pair visas are only issued to women up to around 28 years of age. Since the founding of Granny Aupair in 2010, we have been campaigning for a change in age limits for au pairs and have already approached various national and international authorities and institutions in this matter. Up to now the authorities have unfortunately not seen any need for action. We sincerely hope something will soon happen concerning this age-discriminatory and no longer up-to-date legislation (as a rule the laws came into being in the 1960ies!). As an EU citizen you do not need a visa for trips within the European Union, you can travel with your normal ID documents. For all other cases (for instance if you are from a non-EU country or want to travel to a non-EU country as a EU citizen) you can find out if you need a visa, how to get it and how much it costs on the embassy website of your host country or at the country information of the state department, foreign office etc.